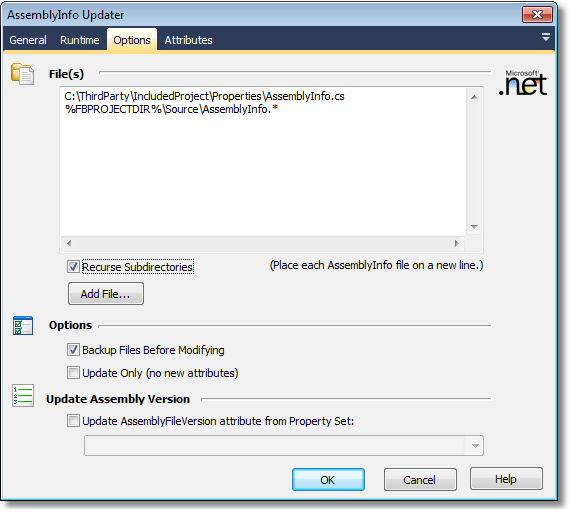 This action allows you to update one or more AssemblyInfo source files. Supported languages are C#, VB.NET, J#, C++ and Delphi.NET. Recurse Subdirectories will recurse subdirectories for any entry which contains a Wildcard character. In the example above, all AssemblyInfo files within subdirectories of "%FBPROJECTDIR%\Source" will be updated. Backup Files Before Modifying - A .bak file will be created before each AssemblyInfo file is modified. For instance, AssemblyInfo.cs will be backed up as AssemblyInfo.cs.bak. 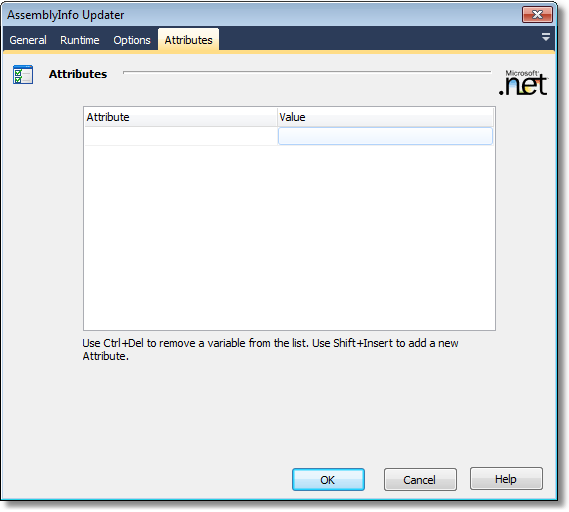 Update Only - No new attributes will be added to the file. Only existing attributes will be modified. If this option is enabled, the AssemblyVersion attribute will be automatically updated using the value of the specified .NET Version Property Set. If the value you want to add to the assembly requires quotes, eg. Then you need to specify the quotes around the Value. FinalBuilder doesn't know any specifics about the attributes you are adding, so you have to manually specify the quotes. Although, if you are updating an existing value, then FinalBuilder will look to see if the value is quoted and preserve the quotes.